• الموضوع : Dr Mohamad Ali El Husseini met with the president of the European Jewish Center in Brussels He stressed the importance of direct dialogue with followers of heavenly religions . 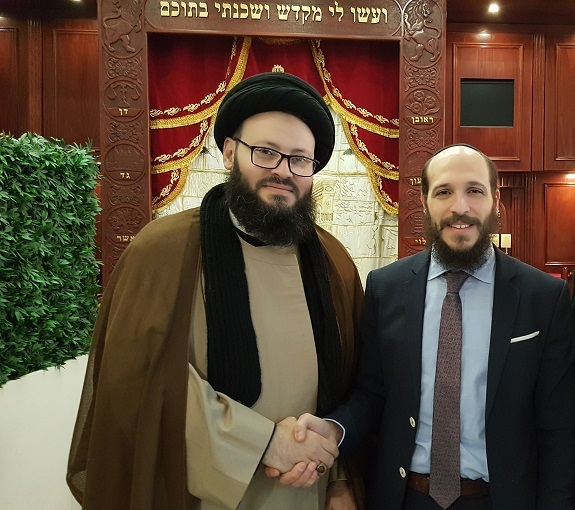 The Secretary-General of the Arab Islamic Council, Dr. Mohamad Ali El Husseini, met with the European-Jewish Center in Brussels and discussed the European issues in the field of interfaith dialogue and the role of the Council and the Center. El Husseini stressed the need for a permanent Islamic dialogue to promote the values ​​of tolerance, openness and moderation, and renounce violence and extremism because it is detrimental to human relations and leads to the destruction of all. Dr. El Husseini said: Dialogue with followers of other religions is the core of the Islamic religion, from the verse: (God does not forbid those who did not fight in religion and did not come out of your homes to justify them and be humble to them that God loves the Adjusters, 8) And dialogue goes further than that to invite Muslims to the charity to them. El Husseini stressed the importance of direct meetings with those involved in religious affairs from various monotheistic faiths, especially the Jews, because meeting and dialogue face to face removes many ambiguities and eliminates doubts and prejudices, achieving the goal of weaving the best human and spiritual relations with all believers in God.